If i were to pick one lake which i liked most in my Canadian Rockies, It would be Emerald lake! That was the first lake we visited during our trip. The surrounding was so calm and reflections were so clear as if i was seeing the mirror image from glass. The feeling i had after seeing that clear water and surreal environment is very hard to describe in words. My wife and I spent our evening there and saw beautiful sunset ( Photos yet to come). Then we head back for our hotel and drove back in night after having dinner. Guess what, it was a full moon and views of the lake were beyond imagination. The temperature was just around freezing point but no sign of mist/fog. 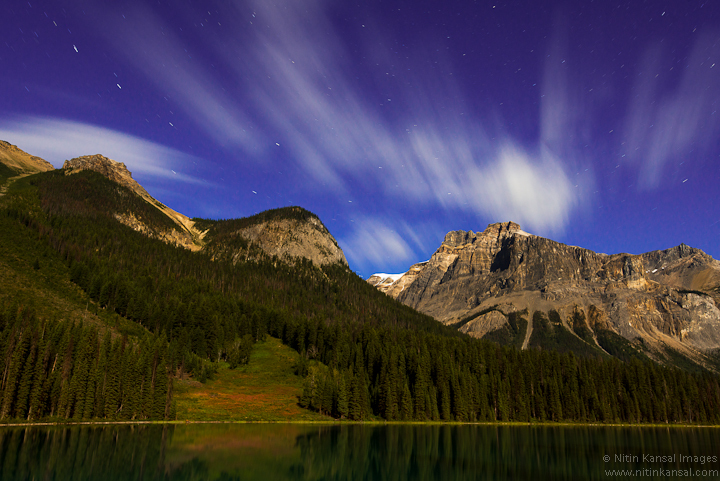 The clouds were backlit by moon light and were reflecting in lake when passing over the mountain. I took the opportunity to put my 10 Stop ND filter and show the motion of clouds against calm Water in lake. In terms of processing, I cropped image, Increased contrast, Curve Adjustment and Black/White point adjustment. Finally exported using Facebook Plugin. This Labor day long weekend I went to drove from Seattle to Canadian Rockies. My Canadian visa was about to expire so my wife and i made a quick plan to head to Canada. The first place that came to mind was Canadian Rockies. It was in our list from long time and we have heard lot about it. The weather prediction was not very great with rain almost everyday on that week. We took chance and decided to drive to banff. The drive all the way from Seattle to Banff was amazing. We were lucky that weather was great w/o any rain. 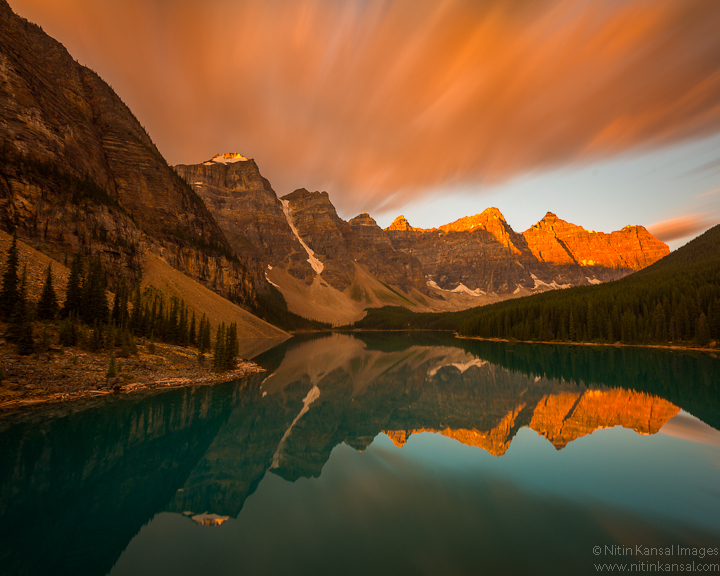 We woke up very early ~5:00 and head towards Moraine Lake. Sky was not looking good at-all. Dark clouds like in Seattle Winter. As soon as we reached moraine lake it started raining a bit. I decided to still head for sunrise shot and took the RockPile Trail. When i reached at top of the rockpile trail, i was amazed to see the view. The water was so clear, All the Ten peaks were reflecting perfectly. I’d never seen such crystal clear water and mountains reflections. I had initially thought that I’ve to fight with bunch of photographers to get good spot as it’s with places like Mesa Arch / Delicate Arch. But there was no other photographer !! The entire lake was mine to photograph that morning.. It was almost 6:50AM and clouds suddenly started moving fast. Sun started to shine from a small window. I quickly grabbed my new 10 Stop filter and this is the result i got after 90 secs exposure..
After i head back, there was sudden snow fall in the area and over 1 inch accumulation occurred in few hours.I was so glad i made the decision to head for shot. Gear: Nikon D800, Nikon 16-35mm F4 VRII, BW 10 Stop Filter. In terms of processing, imported image in Lightroom. Cropped to 4×5 ratio. Adjusted contrast and curves a bit and exported using my facebook/blog preset. Yesterday was fun day catching action at Mt rainier from sunset to sunrise. I went to Rainier to catch meteor showers but didn’t expected nice wilde flowers. I endup taking much more photos than i expected. I’m still going through all of my Meteor showers photos and sorting them. In mean time, here is my Star trails with Mt Rainier. 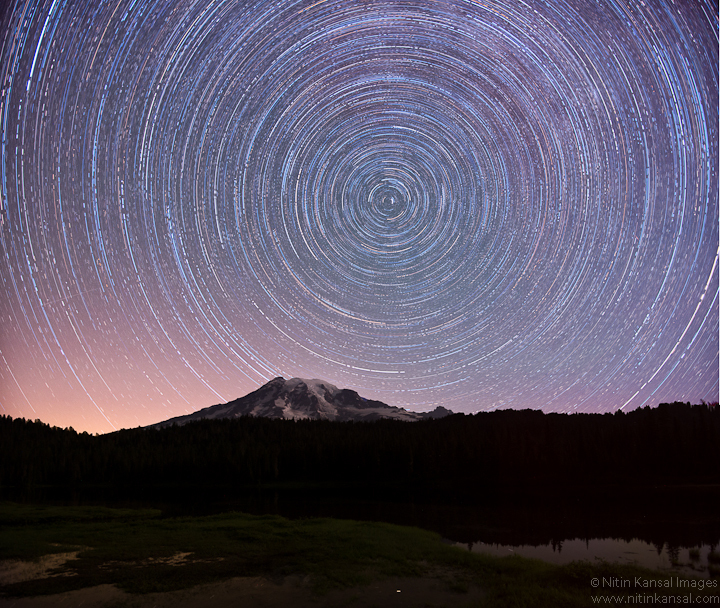 I’m glad i was able to finally shoot a nice star circle above Mt Rainer. The Above image is result of around 3 hours of continous shooting. UPDATE: Forget to mention total number of image. It’s made of total of 58 images. Gears: Nikon D800, Nikon 16-35mm F4. I set my Camera and Tripod for the composition i wanted and set the timing on my remote intervalometer to take picutres of 5 mins long exposure and 0 sec delays ( Camera on bulb mode). 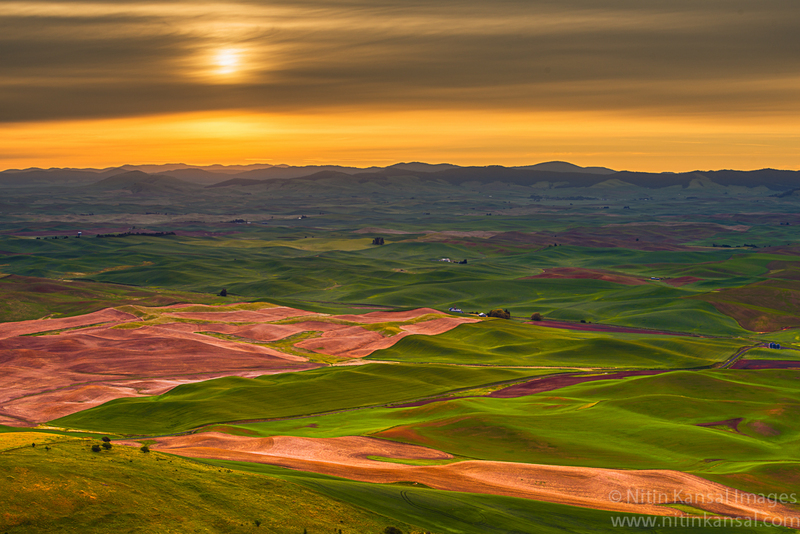 Each image was shot with: 2.5/5 mins , ISO 800/400 and F4 exposure. In terms of processing, Exported all RAW images to Full size JPEG using Lightroom. I used Star Trail application to do stacking for me. You should really try it if you are interested in Night photography. After this application produced the final stacked image, I opened it in Photoshop. Finally i blended it with foreground image of longer exposure: 6 min, ISO1600, F4. Exported this final image using my social plugin for Blogger and Facebook. I hope you will like it. NK. As some of you already know, This weekend is time for Meteor shower. This will be very interesting photographic opportunity too. 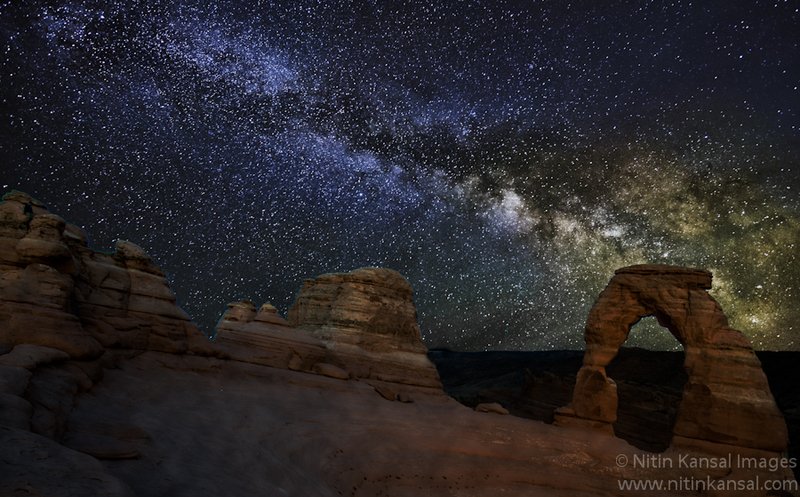 As Skies are clear during Mid August here in PNW, It’s very easy to enjoy this Astronomical event. To watch these meteor shower you do not need any fancy telescope or a device. You can see them from direct eyes without any harmful effect. To see these meteor, you should be away from light pollution from city lights. As a rule of thumb, I always found around 30-45 minutes away from City ( ~40 Miles) decent to watch stars and milky way. The same rule applies for watching Perseid Meteor showers too. Here are the tips which i found very helpful in Night photography like Star Trails, Milky way and Meteors. All of these places are easy to access and does not require hiking or backpacking. This will give you enough time for scouting around the area. During night, It’s difficult to capture details in foreground like flowers, mountain etc. If you arrive early, you pick your spot and take some pictures before it’s completely dark and later takes shots of sky and stars. During Post, you can blend images in your favorite photo editor. Stable Platform – Tripod and Remote Shutter Release is a must! Stable Platform is a must to get sharp pictures in Night. When shooting Milkyway, Stars and Meteors, generally exposures are ~30 Sec. It’s almost impossible to get tack sharp pictures w/o stable platform. A good quality tripod and remote shutter release should be first thing you keep in your gear bag before you head out for shooting! If you have a fancy full frame camera, you are in luck as Full frame camera have bigger sensor and results in better IQ at higher ISOs. But now a days, Digital sensors have improved and you can get decent IQ from entry level SLR too. Noise introduced due to High ISO is easy to fix during post processing. To prevent star movements in your images, your shutter speed should be lower than 30 sec. Ideally around 20-25 Secs. You need preferably wide angle lens to include more sky in your shots. Open your lens as wide as you can ( low F number like F1.8 or F2.8 ). Last but not least, Your ISO needs to be in between 1600 – 4000 to get good exposure. I always start with ISO 1600 and take some sample shots and adjust ISO accordingly. Carry lot of extra memory cards as you would be continuously shooting. You do not realize that you need more memory cards at night than during day because you are continuously taking photos!! Avoid large memory cards like 64GB or above. I always prefer 32GB or 16GB. This prevents you from trouble if your memory card fails as your shots are hedge among different memory cards. Batteries drain much faster during Night. Long exposure and colder nights helps in draining batteries much faster than you would expect. I would suggest keeping 2 extra batteries if you plan to shoot for 2-3 hours or more. If you found this post useful, please share it among your friends and Don’t forget to share your photos here. I would love to see them! This weekend I decided to go to Ruby beach though weather forecast was not great for ocean photography ( not much clouds and not much tides ). 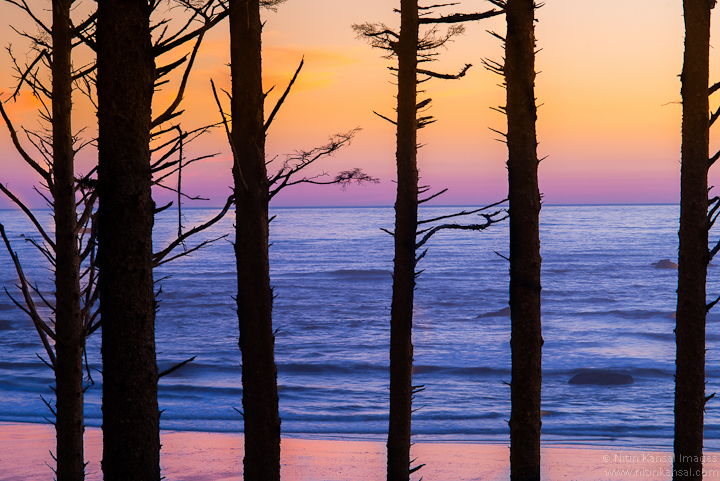 I was waiting to go to Ruby beach and Olympic National Park for so long that i thought lets just do it! I had a great time at beach with my wife. Sunset had decent colors too but sometimes colors are not just sufficient to make a spectacular shot. You need to have clouds to get drama and right waves crashing to get the feel of ocean. None of those were there so i packed my bag and we started going towards car. On the way back i saw these trees against colorful sky and water. I like how trees were contrasting with background. It’s nice to see Motion Vs Calmness ( Trees against Water ) and Cool Vs Warm tones ( Water and sky ) in same shot. In terms of Processing, increased some details in shadows. Fixed WB a bit , it was too cool for me. Increased vibrance by 10% and sharpness by 20%. Everything done in Lightroom 4. The composition with Mt St Helens in front and Mt Rainier was not too bad though i would like to have clear foreground with some interest but that was trade off of arriving different spot..
After 1 hour, i set my intervalometer to take shots every 1 sec for 30 sec exposure.I fired it till i saw milky way rising over st Helens and give illusion of eruption!! Nikon D800, Nikon 16-35mm F4 @16mm , ISO 3200, F4, 30 sec. of course you would need a solid tripod and ball head which will prevent any vibration and remote shutter release/intervalometer. 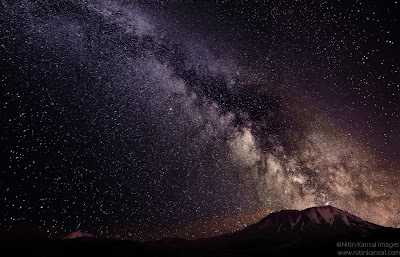 The milky way is a stacked of 26 image using an action for CS6. Then i hand blended the foreground image that i captured earliear and blended both using luminance masking mode. Then little contrast and tonal boost using Nik Plugin.